Make carvings from white eraser or safety-cut to have coordinating images to go with your rubber. The gravestone carvings make the image solid so when you stamp the rubber image on top it is no longer transparent. 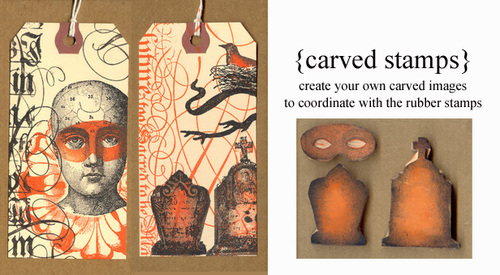 To make the mask: stamp the face onto paper, then draw in a mask. Cut our your drawing to use as a template for your carving.